Bio soluble AES fiber Tape（Low-bio persistent fibreTape） is produced by high quality Bio soluble AES fiber and woven from yarn. It can be used for high temperature applications up to1050°C. The cloth is reinforced with fiberglass filament, and optional stainless steel wire (Inconel/alloy steel wire). Or even short working temperature could be reached to 1260°C. It has good resistance to acid corrosion, resistant aluminum, zinc and other molten metal erosion. Bio soluble AES fiber is a high-temperature insulating wool composed of man-made vitreous silicate fibers. Bio soluble AES fiber is exonerated from the carcinogen classification in the European Union under the term of NOTA Q of European Directive 67/548/EEC. Bio soluble AES fiber has been developed to show improved high temperature characteristics required to act as an alternative to RCF. The Bio soluble AES fiber textiles offer a versatile alternative to traditional insulation solutions for commercial, industrial, and transportation applications. 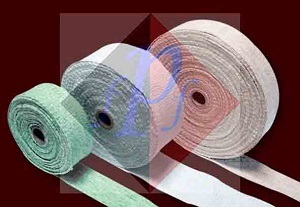 Bio soluble AES fiber Tape is produced by high quality Bio soluble AES fiber and woven from yarn. It can be used for high temperature applications up to1050°C. The cloth is reinforced with fiberglass filament, and optional stainless steel wire (Inconel/alloy steel wire). Or even short working temperature could be reached to 1260°C. It has good resistance to acid corrosion, resistant aluminum, zinc and other molten metal erosion. 1. All the listed are plain weave with selvage. 2. Roll length is 30m(100ft) or 50m(164ft). 3. The other special specifications, please contact us.